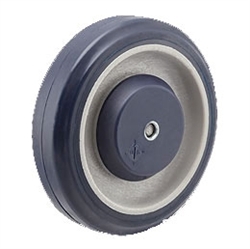 Pemco PolyKat 5" universal replacement shopping cart wheels are made of durable polyurethane on polyolefin wheels 5"x 1.25". Fits 5/16 Axle and nut. Wheels feature a sealed precision ball bearings and have a double raceway that is insert-molded into our polypropylene hub. This bearing is a single spindle design that cannot become misaligned with use. It is also sealed on both sides after being pre-lubricated with high-quality grease. Fits 5/16 axle and nut. Steel Plain Axle Kit 5/16" x 2-1/8"
We replaced the casters and wheels on over 100 carts. Very well pleased got them quick loved it. I ordered 100 wheels to replace broken ones on shopping carts for my retail store. They were a perfect fit and look great. I ended up purchasing 200 more to finish the rest of the carts and have some spares. I can not comment on the durability as of yet as they have only been on a couple of weeks, but so far they have held up well and still look good. I would recommend these wheels to any retail facility who has carts that really get some wear and tear daily. I ordered 8 shopping cart wheels. I had quick response and delivery. The wheel quality was excellent.